Anand says phones will be better than low end desktops in a few years. Ben. A couple of months ago I had the opportunity to join a bunch of NVIDIA employees for dinner. Among those at the table were Michael Toksvig and Tony Tamasi. Michael, or Tox as he likes to be called, worked on the AA hardware for NV17, NV25, NV40 and G80. He managed to skip NV30. More recently Tox was the chief architect on GeForce ULV, the GPU integrated in NVIDIA's Tegra 2 SoC. Tony Tamasi is someone I've known for around a decade. I first met him while he was working at 3dfx, and got the pleasure of working closely with him when he later moved to NVIDIA to do technical marketing. Both Tox and Tony are very passionate engineers at heart and are up for a good conversation. The conversation we had at dinner that night was on the future of the smartphone and the mainstream PC. Tony argued that technically, within 3 years, a high end smartphone will be able to offer the performance of a (low end) mainstream PC today. Admittedly that isn't the highest bar possible as virtually everything above a netbook falls into that category, but it's a valid claim. Motorola is attempting to jump start that evolution. 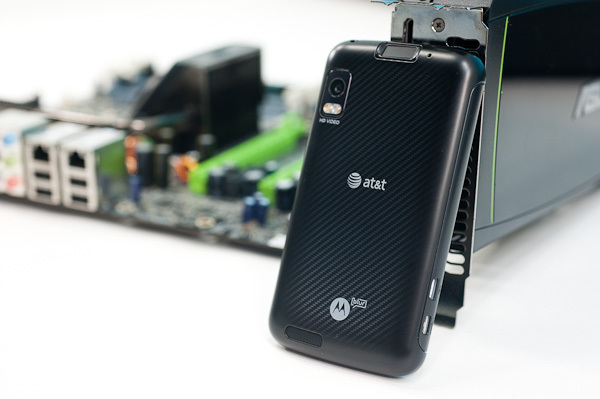 The Atrix 4G is the second Tegra 2 based smartphone we've received in our labs, but unlike the Optimus 2X it hopes to be more than just a superphone. Equipped with 1GB of memory and the ability to run a full version of Firefox for Linux, Motorola hopes the Atrix 4G will be a smartphone, superphone and netbook replacement all in one. A couple of days ago I got a package from Motorola. In it was the Atrix 4G, a multimedia dock, bluetooth keyboard and mouse. I'm currently on a flight to Barcelona to join Brian Klug as we cover Mobile World Congress for the first time on AnandTech. MWC is a very large mobility focused tradeshow that's held yearly. From a content standpoint it's like a smartphone/tablet CES. It takes days for us to run through all of our battery life tests, and usually a couple of weeks of constant usage for us to put together one of our smartphone reviews. With Brian working on the Verizon iPhone 4 and both of us en route to MWC, it'll be a little while before we can bring you a full, in-depth Atrix 4G review. That being said I wanted to get some of my thoughts out there as this is a highly anticipated device that attempts to do a lot. What follows is by no means a full review, I wouldn't dream of calling it that. But rather an account of my experiences with Motorola's Atrix 4G thus far. Give me some time after MWC and we'll get a full review up. The Atrix hasn't left my side since it arrived and I'll be using it to keep up with emails and schedule meetings at the show as well.